Vehicle Loans -- Auto Loan Rates Have Never Been better! Buying a new or used car is exciting, but usually the process is not. Auto loan rates have never been better at Tampa Bay Federal Credit Union! Walk into that dealership knowing that you already have the best deal. Because sometimes the upgrade isn’t leather seats, it may just be a better loan and knowing with certainty what you can afford to pay. Credit Unions are known for being the best place to shop for auto loan rates -- Tampa Bay Federal Credit Union is a leader in this area. If you're not already a member, you should join now -- and walk into that dealer knowing what you want and what you can afford. Before you decide what you want, see how much you can afford with our auto loan rates calculator -- find out what your monthly payment is for the car you want. With our low auto loan rates you might be surprised at what you could drive off that lot. It pays to know ahead of time because the dealer knows you're a serious buyer and will bend over backwards to accommodate your needs. This is a position you want to be in when buying a car! Buy a new or used car with Tampa Bay Federal Credit Union's low rates & get more car for your money! Are you ready? Apply online or call (813) 247-4414 x7606. Or just drop by any of our branches and fill out an application. Find the right car, at the right price, at your convenience -- Tampa Bay Federal Credit Union is there for you! 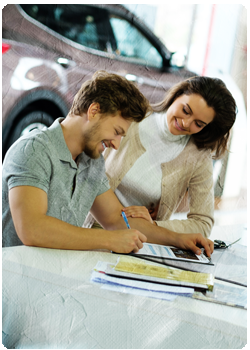 Finding a car and getting financed is a breeze with us! As the ultimate federal credit union marketplace for cars, AutoSMART provides members with access to state-of-the-art research, financing and shopping tools. With a network of over 11,000 participating auto dealers, AutoSMART helps make vehicle shopping easy and convenient. Online and mobile shopping tools guide you through the entire car buying process. Get SMART about your next vehicle. Unlike other auto buying websites, AutoSMART will connect you with dealers that can help you get the vehicle that fits within your budget. And, we can help you get pre-approved before you visit the dealer, so you have even more negotiating power! Assistance with vehicle selection: the right features and the right payment for your budget. The best purchase and lease options and extended warranties. Listings of an extensive dealer network for all makes and models, new or used. Complete explanations of actual dealer costs, current rebates and incentives. Consultation for the entire transaction. Learn more about our Auto Advisor Program in this video. Our partner CU Auto Branch works closely with Tampa Bay Federal Credit Union and our members for a no-haggle buying experience. Browse their current vehicle inventory online, visit them at 6809 E. Hillsborough Avenue in Tampa, or call them at (813) 249-2886. Tell them Tampa Bay Federal sent you!